Wild: Apparently a cross-breed of a Triceratops and Styracosaurus, Triceratops styrax has both the characteristic three-horned face of Triceratops and the prominent horned-ridge of Styracosarus. Domesticated: A common mount for those that ride dinosaurs, Triceratops doubles as both pack animal and combat war horse. Known Information:Normally a very docile grazing animal, Triceratops becomes extremely aggressive once angered. Triceratops will chase down would-be predators (and egg-stealers) with incredible prejudice. 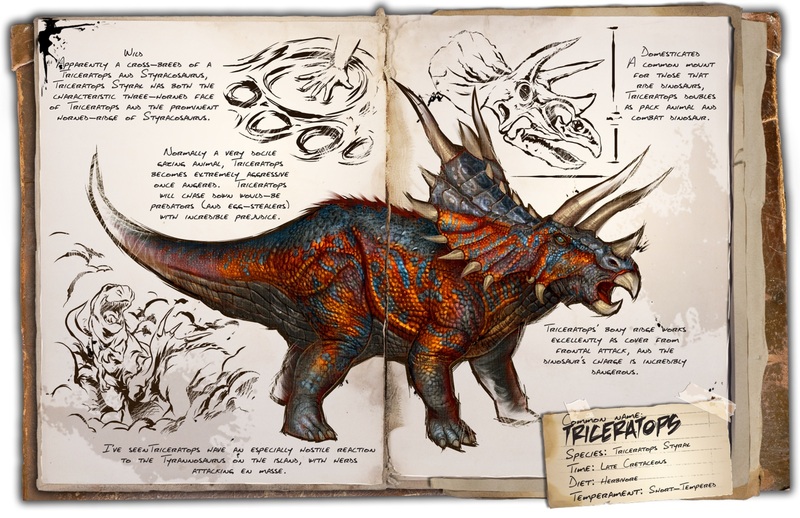 Triceratops bony ridge is very effective as cover from frontal attack, and the creature's charge is incredibly dangerous. I've seen Triceratops have an especially hostile reaction to the Tyrannosaurus on the island, with herds attacking in groups.